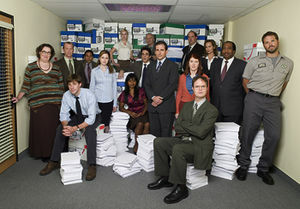 I cannot argue with Salon’s Willa Paskin that the argument at the core of The Office finale was kind-of depressing: “In the end, it argued that settling for a mediocre job for way too long can bring you happiness beyond measure.” That’s the absolute antithesis of my own belief structure—I am always rooting for the small-town girl to make good, to have the expansive life she’s capable of. And I cannot argue with Paskin’s assertion that in many ways, the finale negated the very idea the series seemed to be lampooning: the soul-sucking nature of cubicle-driven America. But in the end, I fell for those closing arguments: They were glad they had been filmed for the documentary-within-the-show. They had insights about themselves while watching their edited-for-TV foibles. They could show it to their kids someday. Partly this rang true to me because I’ve interviewed a fair number of reality-show participants in my time, and they all say this stuff. It makes sense. You already did the show, for better or worse. You’re bound to make the best of the memory, shrug, and go on with your life. And while I don’t believe they ever are 100-percent glad they’ve been filmed, I do think they must have insights, and they probably show (selected) clips to their kids someday. It would be both cringeworthy and cool, for instance, to have footage of yourself falling in love with your soul mate. My partner and I once dug up the first emails we ever sent to each other — we cringed, we laughed, we swooned. But, you know, The Office finale was fine for what it needed to do. Did we need Jim and Dwight to have become besties in the past year? No, but to be honest, I don’t totally doubt that development. I think it was meant as a sign of Jim having accepted his life in Scranton and having matured to a point where he could see Dwight as the benign goofball he was. Weren’t we all a little uncomfortable at times with his frat-boy pranking of the less-cool kid in the office anyway? In a way, I thought the message of the finale was that Jim had earned that shot at a grander life in Austin by making peace with Scranton. Or maybe I’m just rationalizing my own emotional release. Our reactions to such things as TV finales involve so much more than their artistic merits. We are almost always mourning for, pining for, or simply recognizing the time that has passed in our own lives between the show’s debut and its finale. I remember watching that show from the bitter beginning, when no one watched. I remember (and this was obviously unique to my job at Entertainment Weekly) forming a bond with then-NBC president Kevin Reilly because of my early love and support for the show. I remember its rise, I remember having the great privilege of reporting on the episode where Jim and Pam got married. I can look back on how my own life has changed in that time and appreciate the special moments it brought me. And even with all of those glamorous connections my job afforded me to the show, I still remember most clearly how I swooned, and even where I was, and what it meant for me and my then-unrequited crush, when Jim and Pam kissed for the first time. As long as a finale can connect us to all of that, it’s done its job. ‘American Idol’: Competence Is Boring, But Could It Be Profitable? Couldn’t have said it better myself. I have not been distraught over a show’s end since “Full House,” and yet I do feel at peace with the character’s stories. Except for Creed, I hope someone visits him. I must tell you that I loved your description of digging up those early email exchanges with your partner as “cringeworthy.” One, because I can identify and think its the perfect description of my own early emails with my husband… and two, I remember reading a very early review of the show during season 1 where a critic described Michael Scott as being the most “cringeworthy, uncomfortable character ever to grace our television screens.” While not meant as a compliment back then, it today is an understated “all that and a bag of chips” compliment when describing what is so lovable and endearing about Michael Scott. (sorry for the “all that and a bag of chips” reference… I know its very lame and very dated. LoL) ) I cried from the beginning of the retrospective that aired before the finale, until the end of the finale… and upon the first quick pan of Michael Scott, I nearly lost it as Dwight shouted, “I can’t believe you came” and then hugged one another. (that’s a lie, I did lose it) I’ve been watching older episodes recently, knowing the end was coming very soon… and have had fun in doing so. I too have an immense appreciation for the MTM show and have found myself having a very similar attachment with The Office and just about all of its characters. Watching the evolution and/or maturity of the characters has been in my eyes at least, a subtle, sometimes clumsy but almost always, realistic and very human transition. Ugh… and the writing, what can possibly be said about the writing, except that I can only dream of having the sort of God given talent one must have in order to write for a series such as The Office, just brilliant. I started my evening none to thrilled about watching the two hours devoted to The Office on NBC last night and wasn’t sure where my lack of enthusiasm was coming from… it suddenly hit me like a bolt of lightening after Dwight happily found Angela squished inside the trunk of his car, courtesy of Mose. I was in denial and wanted this show to just keep going on and on and on and on… and so on and so on and so on, e.t.c… As mushy and even maybe corny as it may have seemed, I really loved the last individual interviews for the “documentary” with the characters because we as the viewer knew it was sincere and genuine. It was their Lou Grant, “I treasure you people” finale moment. With that, I don’t think I’m done crying yet… hell, I still cry whenever I see that “I treasure you people” scene at the end of the MTM show. LoL! Exactly! I think both this show and 30 Rock looked at The Mary Tyler Moore Show finale for inspiration. I can’t prove it, but a lot of evidence is there! Both profoundly affected by MTM, whether people now realize it or not.